The Wright State University women’s doubles team of Luisa Pelayo (left) and Grace Whitney currently have an 8-4 record together this season. 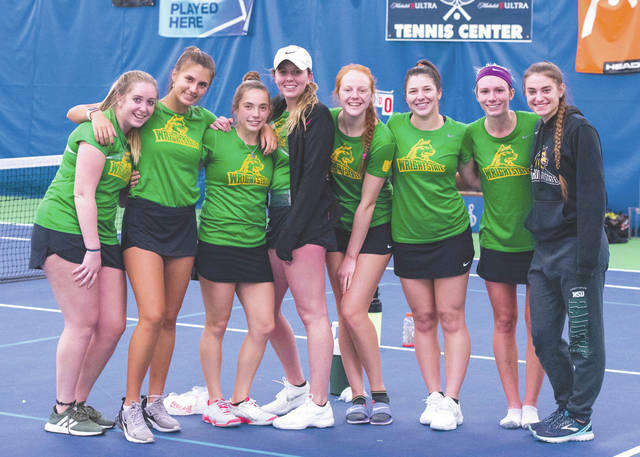 The Wright State University women’s team members enjoy a February team win over St. Francis University, at the South Regency Tennis & Fitness Center in Miamisburg. FAIRBORN — The play of Wright State sophomore women’s tennis player Grace Whitney has the Raiders feeling confident with about a month left in the college regular season. Whitney and her Portuguese teammate Luisa Pelayo had productive freshman seasons as doubles partners in 2018 with a 19-12 record when they were paired together. It has been more of the same this year, as the duo is 8-4. On March 16, they defeated Mid-American Conference doubles teams from Ball State and Miami at No. 1 doubles. In late January, their effort was rewarded with Horizon League doubles team of the week honors, which they also received once in 2018. 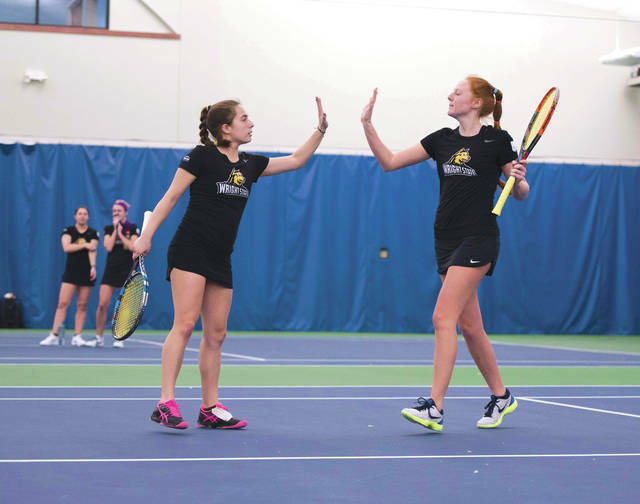 On Saturday March 23, they started the league schedule on a high note by defeating Northern Kentucky in a doubles match 6-1 on their way to a 5-2 team victory. “She (Pelayo) is really good at the baseline making balls, and she hits really great shots, so I like to set up at the net,” Whitney said. “I’m tall (5-foot-9) so I have a long reach, and it’s a lot of fun to just go for it and be aggressive. She gives me a lot of opportunities to do that. “Even though our game style is not similar, we click very well and we play good with each other. Grace motivates me to be the best that I can be every day.” Pelayo said. Burns is proud of the improvement, confidence building and further consistency Whitney has undergone between her freshman and sophomore seasons. “It’s important for me to stay positive and look at the bigger picture. Even if I’m going to lose a match that I’m playing, I can just give it my all,” Whitney said. Quality play on the doubles court will be pertinent to the outcomes during the now-under way Horizon League campaign. Whitney has also shown glimpses of her singles talent, as well as perseverance at times. At the ITA Regional fall tournament in Chattanooga, Tenn., she won a three-set thriller against Lipscomb’s Thabile Tshatedi after being bageled 6-0, 6-0 to that same opponent two weeks prior. “It was proof that anything can happen in these matches and that if you can be positive and believe, you can overcome a lot,” Burns said. Hailing from Imlay City in northeast Michigan and a graduating class of around 130 people, Whitney wasn’t sure she that collegiate tennis was a good fit. Her coach encouraged her to look into her options. Between the lines, Whitney studies environmental science and has an interest in pursuing a consulting or legal role in that field. At the moment, Whitney feels there is an environment conducive to success as the conference schedule is now in full swing. Wright State’s team record is currently 8-10 this season. The Raiders will host Indiana University Purdue University Indianapolis in a Horizon League starting at 10 a.m. Saturday, March 30 at the South Regency Tennis and Fitness Center in Miamisburg. Story by Alan Hieber, WSU Communications (wsuraiders.com/).